Nature does not permit energy to come out of thin air without a perfect counterbalance (anti-particle). That includes intermediary particles. These are the allowed phase transforms. To conserve energy, charge, and phase, they must occur in pairs (one and one ). In some phase transition diagrams the matched pairs we name " " for convenience. The only other rule is that the arrows in and out of these phase transforms may be applied in reversed time, in a Feynmann-like trick. Still under investigation (but considered extremely likely) is whether the number of time-reversals on phase transform pairs must also be conserved. i.e. if there are a total of 3 time-reversals on transforms within a "decay", there must equally be 3 time-reversals on the transforms as well. The "ultimate time-reversal" on a matched pair of VT0 transforms results in particle creation in groups of four quarks at a time: two pions where the sum total energy (all charges, all phases / colours) always totals zero (including the gamma radiation needed to separate the two pions). 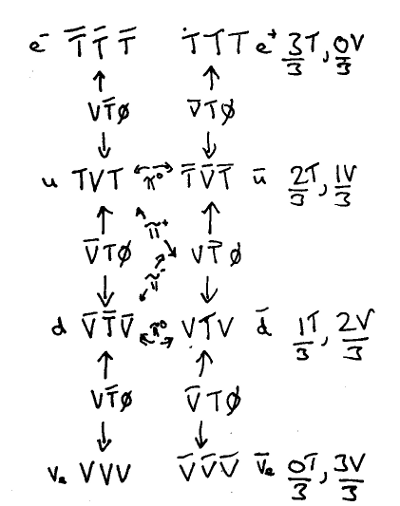 Also of note is that the concept of a "gluon" comes from when a pion's two quarks are simultaneously the input and output of a matched pair of VT0 phase transforms. What is happening in figure 8 is that each of the two quarks of the pion+ (top) undergo phase-transformations into positron and neutrino (bottom), but the energy to do so requires a balance. 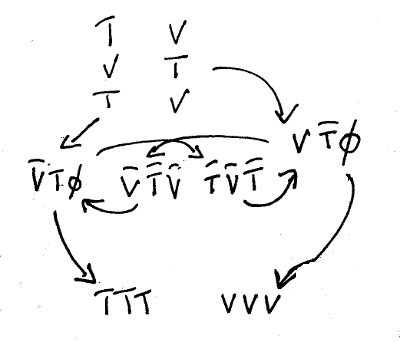 That energy comes from the simultaneous creation and destruction (centre) of a pion-, which acts as the dual simultaneous input and dual simultaneous output of both VT0 phase transforms. When a pion is created and then instantaneously destroyed in this fashion as an intermediary aid in phase transforms, the Standard Model gives it the name "gluon".